This Brussels Sprouts Recipe was originally posted in September 2014. 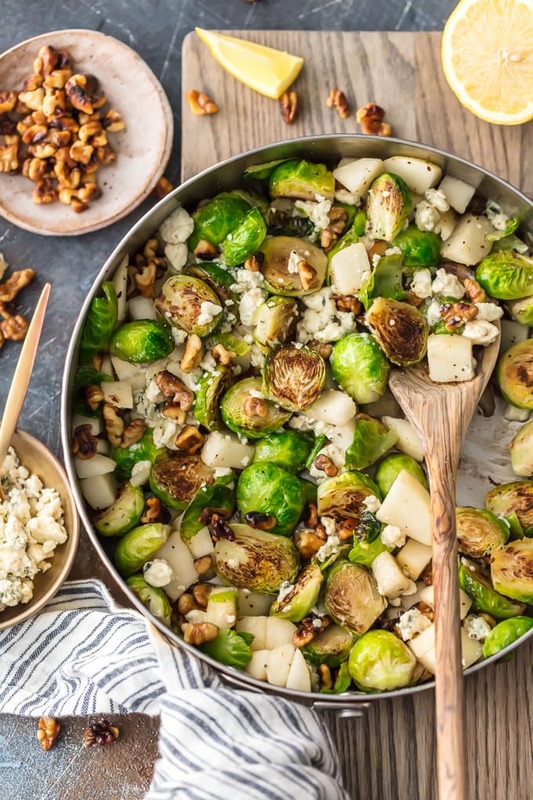 This Brussels Sprouts Recipe with Pears, Blue Cheese, and Walnuts is our favorite way to dress up a healthy side dish. These Brussels Sprouts are unique and so full of flavor. The pear pairs (ha!) beautifully with the blue cheese and toasted walnuts, making sure even the pickiest eater want to eat their greens. Such a great holiday side dish! 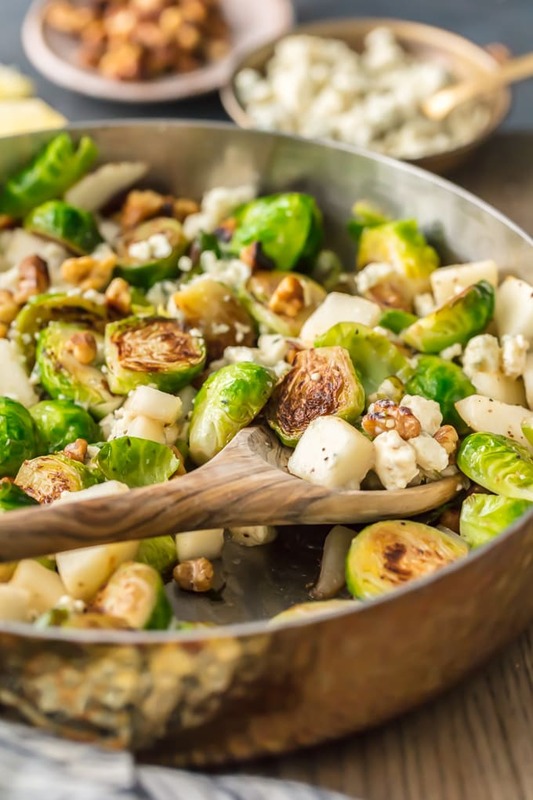 Brussels Sprouts with Pear and Blue Cheese are so delicious, even your kids will eat them. It’s about time I found a Brussels Sprouts recipe I truly truly loved (also…when I first posted this recipe back in 2014 I totally thought it was Brussel Sprouts and not Brussels. I’m called The Cookie Rookie for a reason LOL!). I fought trying them for so long…I was never even forced to eat them as a child! But as I delve more and more into the food blogging world…these healthy little beauties are hard to ignore. People just rave about them…I had to give them a try. Of course, if I’m going to try something…I’m going to add cheese. That’s a given. Trying Brussels Sprouts for me meant mixing in blue cheese crumbles, freshly sliced pear, and toastedwalnuts. I couldn’t just try them with salt and pepper. I needed to dress them up. I wasn’t disappointed. 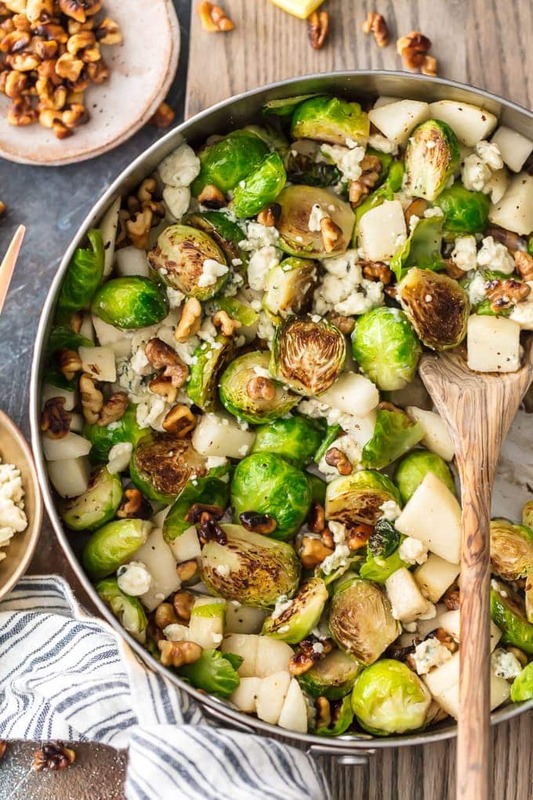 This Brussels Sprouts Recipe has quickly become one of our favorite holiday side dishes for Thanksgiving, Christmas, and Easter! For me, I love to cook brussels in a skillet on the stovetop. You can roast them in the oven, fry them, steam them, or even boil them. But for me…they’re just so easy to cook on the stove over medium heat. They’re quick, easy, and SO delicious. I especially love the flavor combination in this simple side dish recipe. The crunch from the toasted walnuts pairs beautifully with the creamy blue cheese and bright fresh pear. 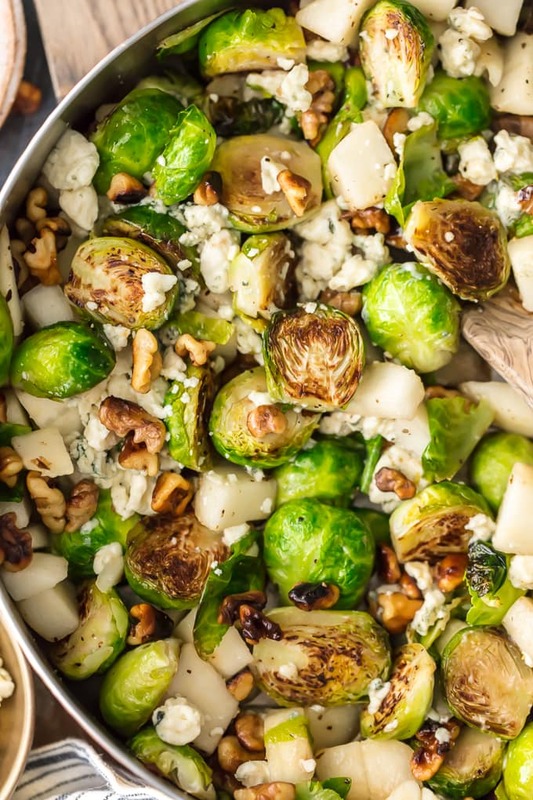 If you thought you didn’t love Brussels Sprouts, this recipe can make you change your mind. Give it a try. There is so much to love about this vibrant veggie. For one, this is quite possibly the easiest side dish I have ever made. I LOVE easy recipes. It’s kind of my thing. 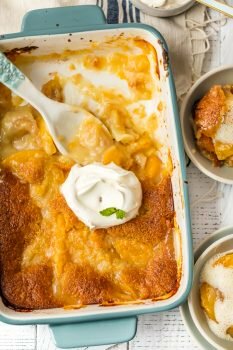 I couldn’t believe that making these literally meant cutting them in half…and putting them in a pan. That’s IT. I mean…really? Well I guess you do have to chop up the pears and toast the walnuts…but those are simple steps as well. If I can make this recipe, you can too! They’re also healthy. Its never a bad thing when a delicious and easy recipe also just so happens to be good for you. Brussels Sprouts for the win! Who knew? I have a feeling you’re going to be making this often once you give it a try. 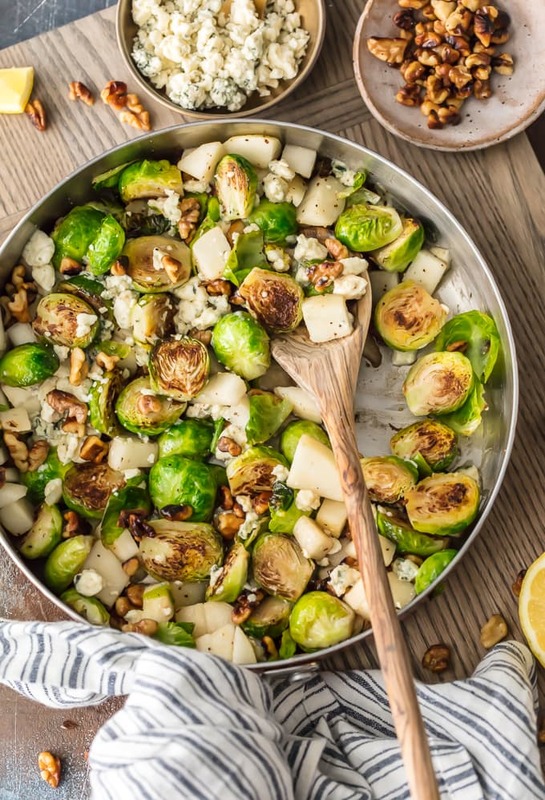 Thanks for giving everyone’s most hated green a try with this Brussels Sprouts Recipe. Let’s give brussels a new reputation! There’s so much to love about them. If you want to try a few more recipes proving how delicious they are, be sure to check out this Brussels Sprouts Gratin with Bacon, and Bacon Pecan Balsamic Brussels Sprouts. 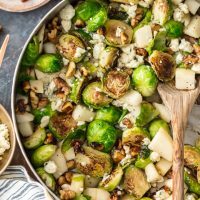 See the recipe card below for details on How to Make Brussels Sprouts with Pear, Blue Cheese, and Walnuts. Enjoy! Heat walnuts in a large skillet over medium heat until slightly toasted. Set aside. 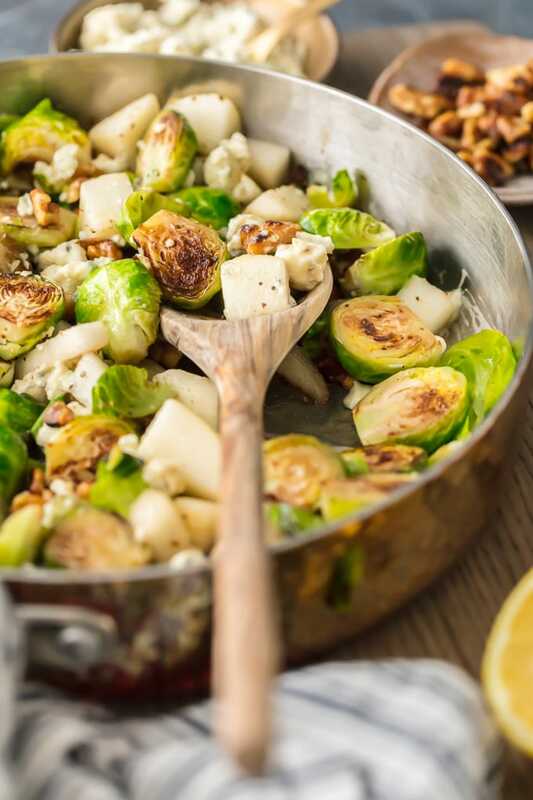 Uncover and add walnuts, pears, and lemon juice; stirring to reveal the caramelized brussels sprouts. Continue cooking for about 3 more minutes. 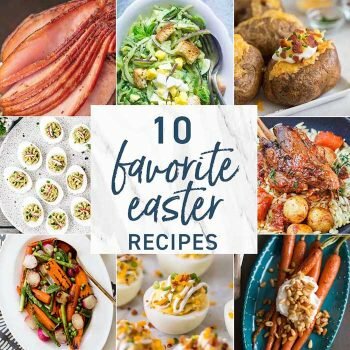 AROUND THE WEB: Looking for more healthy Easter side dishes? Our blogger friends have the right idea with these recipes; Vegan Green Bean Casserole, Broccoli Cheddar Quinoa Bites, and Spiralized Sweet Potato Fries! I’ve never made or even tried brussels but this looks very tempting. Great idea to put cheese in there. You can’t go wrong with cheese! I was the same way Melanie!! I had to throw cheese in there for my first venture :) Thanks so much for stopping by! I LOVE your site! We loooove roasted brussel sprouts! I’ve never thought to pair them with…pears :) Sounds delicious! Pinned! We have roasted them with pecans before and it was realllllly good! THIS is the way to eat brussels sprouts (say that three times fast!). I’ve added cranberries, but not pear. Great recipe! I’m glad I’m not the only one that likes brussels sprouts. Definitely need to recreate the recipe, the pear and blue cheese is a perfect way to kick up the flavour of the sprouts! I thought I didn’t like brussels sprouts until I gave them another try recently! So pleasantly surprised! This recipe looks delicious! Can’t wait to make it! Yessss. I am obsessed with brussels sprouts! This sounds awesome with the pear and blue cheese! No way am I waiting for Thanksgiving. Brussels sprout and pears just went on my market shopping list. Thanks Lisa! The pears and blue cheese helped me to ease my way into brussels sprouts world :) lol. Thanks for stopping by! Made these tonight – what a wonderful mix of tastes and textures. This will be back on my table for sure. Thanks for the recipe. I’m so glad you loved it! Thanks so much for saying hi! I think I’ve found my dinner for today. :) Is this meal good with mozzarella too? I haven’t tried it with mozzarella but I bet that would be fantastic! I’m always a fan of adding cheese. Thanks for stopping by!